for the past 2.5 weeks i've had terrible morning sickness. i haven't actually gotten sick yet, but the neusea has been terrible. without being completely gone, it has relaxed a bit the past three days. i'm really hoping that i am learning to take care of this. i cannot imagine what it will be like if i'm still feeling this way when school starts again. i mean, i've hardly left the house, it's been so bad. absolutely nothing sounds good. when it's time to eat, it's hard to shove anything down. my mouth is dry all the time and i can't stand the taste. i got tired of peppermints pretty quickly and read somewhere that a few people sucked on lemon drops. believe it or not, that has actually kind of worked. it doesn't leave a super strong flavor in my mouth and while it is really sour for a few minutes, i kind of enjoy it. i've tried a few times to eat eggs in the morning (protein, protein, protein) but i just can't. i tried once again this morning because that's what my doctor told me to do yesterday. i can't. about the only thing i can eat is a bowl of cereal. i guess i'll just do what works. michael has been amazing. he has been grocery shopping, cooking, cleaning (except for that one day) and waiting on me hand and foot. i think i could get used to this. :) i do feel bad for him though because in these two weeks off, he's been stuck at home with a bump on a log. i've sent him out several times to play golf and for that he's grateful. he's given me great back rubs and run perfect temperature baths. when we first found out we were pregnant, the baby was the size of a sesame seed. since then, instead of just saying "it" we've been calling him/her sessi. yeah-we're all about the nicknames. michael wants a girl and i want...either. i know everyone says that, but it's really true. i'm just happy to be given this chance. we pray for sessi's health all the time. i know it's still early in this pregnancy and things can happen, but we know God is in control of whatever happens. when we found out, we drove to san angelo to tell mom and dad. we left a little package on their doorstep, rang the bell and hid behind a bush. mom came out, picked up the christmas wrapped gift, looked around and walked inside. the next time we saw her, she was bawling like a baby and could hardly speak. it was really sweet. they are both so excited. i can't believe i'm giving ellie and grayson a cousin. every time i open my computer i see their picture on my desktop and think about how sweet they'll all be together. sweet babies. as sick as i've been, this is a pretty amazing experience and i'm honored to be a part. according to my babycenter website, baby kotze is about the size of a blueberry!!! we found out a few weeks ago and i am now 7 weeks and some days pregnant! our first doctor's appt was today and we got to see the baby's heart beat and find out the offical due date. august 17th, 2009. ahh!!! i can't believe it! 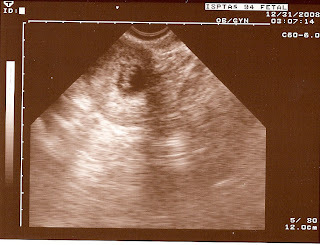 well, here it is, the first picture of our 12 mm baby! today my baby brother turns 25. he's a quarter of a century old. :) i can't believe it. i still remember when he was small enough for me to put in my baby cradle and rock. he's gone and i just can't stand it anymore. as previously thought, we did sleep in today. until 11:30. yeah, we don't have kids. yeah, we know when we do we won't be able to do that. yeah, yeah, yeah. we know, we know, we know. but today, we loved every minute of it!! we opened our presents, just the two of us. i got a really soft brown robe that i told michael about a long time ago. i also got a rachel ray cookbook, some new perfume, a beanie and some stocking stuffers! michael got a sweater, ratchet and socket set, screwdriver set (yes the man likes tools), a sony navigational thingy and one final present. michael has a picture of his mom and her brothers as babies. it's very vintage where the boys are wearing cream shirts with little bow ties and brown shorts. michael's mom has curly blond hair and is wearing a light blue dress with ivory ruffles. i had the picture framed and matted at hobby lobby. it turned out beautiful and michael really loved it. i love him. i called ellie this morning. after the hello's and such i asked if she got a wagon from santa. there was a short pause and then she clapped her hands and yelled, "yea!!!!!!" i think she was very excited about her wagon but i'll let sarah tell that story. my house is a mess but michael and i are going upstairs to watch a movie and finish christmas off right. merry christmas, everyone. hope it was wonderful! as i snuck back into my bedroom with strict instructions for michael to, "stay out! ", i was taken back to my childhood. i smiled remembering mom closed up in her bedroom for the last few hours of christmas eve. she worked hard wrapping the final presents to go under the tree. i was always so lucky because when my presents were wrapped, i got to enter the secret lair and help wrap the boy's presents. those were great memory making times for me. just me and mom, sharing secrets and giggles over soon-to-be-enjoyed christmas presents. it really was a blast. i also had, for as long as i can remember, had the distinct privilege of wrapping mom's gifts from daddy. man! i was so in the loop! i knew what everyone was getting before they did! :) yesterday i was talking to dad when he suddenly realized that i wouldn't be there for the wrapping! :) i'm not worried, i know he'll do fine. i'm excited that tomorrow, michael and i will share our first christmas between just the two of us! i know we'll sleep late, then rise and open presents. we'll have a breakfast of pancakes and bacon and laze around doing nothing. the only thing i'll remember to do is give amy a call. talking to each other on christmas day has been a tradition for us for as long as i can remember. it will be a little strange to not be with mom and dad tomorrow, but i know they'll be thinking of us just as we'll be thinking of them. i guess it's been long enough since my last post. but...for the next two weeks, I'M FREE!!! no school 'til january 5th. can anyone say hallelujah?!?! michael and i got up this morning and shared some scrambled eggs. then, he was off to the golf course! i've spent the day watching tv, surfing the internet and reading blogs. my plan is for the next two weeks to be spent much the same way. all except for two short christmas trips to odessa and san angelo. well, happy holiday season everyone. hope you have a great christmas and get to spend plenty of time with family and friends. because my kids are psycho. i mean, since dec 1st, the have been absolutely nuts. i had to leave school early today to attend another meeting for our immigration paperwork. sadly, i was happy to leave. they are just crazy. i will be so happy when next friday gets here. we've known each other for a while and what a great time it has been. you are getting older now and i'm afraid i will no longer be able to hang out with you in your severely old age....what am i saying?!?!?! i'm older than you by 3 months! honestly, you are so important to me and i love you dearly. i hope you always know that. i hope your husband took you out and your boys loved on you all day. i wish i were there to give you a hug! happy birthday, friend. btw-i'm glad i sent you that text this morning, my internet has been down all afternoon and i couldn't' send you a birthday post! :) hope you had a great day! i love you bunches! each day when the bell rings, i walk my students out and dismiss each of them at their ending destinations. from the first day of school, when i've dropped johnathan off at his bus, he's walked to the steps, paused and turned around to give me a huge hug. he always says something cute in a little sing-song voice as he turns back to the bus. "see ya, mrs. kotze. i love you!" "you made this the best day ever, mrs. kotze!" "tell mrs. mcgee i said hi, mrs. kotze!" well, for the past week and a half since being back from thanksgiving johnathan has been so proud of himself for being in the holiday spirit everyday. "bye, mrs. kotze! have a happy new year!" yeah, i've got quite a ways to go to get to seph's amazing 1000 posts. wow! i loved that post too. i went through every link and was reminded of the awesome things to happen in her life since i've known her. wow! well, the battery for my camera was just put in the charger about 12 minutes ago. there won't be any pictures today either. i guess it's a good thing because i have wrapping paper, ribbon and weird shaped children's toys all over my living room. how on earth are you supposed to wrap those dumb things anyway?! it was a beautiful day today. now? it's even better! the wind is blowing, it's been raining and the cold weather is moving in!! michael and i are planning our first fire tomorrow night with some curry and rice to eat. it's gonna be a cold day with a nice warm fire and a nice warm meal. maybe we'll even eat our meal in front of the fireplace. i have quite a few christmas presents already under the tree for my family. it's really fun because i am usually a terrible procrastinator and i never get to really enjoy the beautiful wrapping and bows. this year, i am! it's nice! i am finding, however, that i am turning into my mother. making bows like she does. decorating a bit like she does. i'm also finding that i don't mind it near as much as i thought i would when i was 15. thanks for all of the influence, marme. right now i'm looking forward to taking off my socks and sliding between crisp, cold sheets, shivering until my feet finally warm beneath the weight of my nice, fluffy comforter. hmmm...sounds like heaven to me. i'm just going through another blog drought (writing only. i've been reading like crazy). i've been too tired or too lazy, i don't know which, to post anything. i've started new posts at least twice, only to get a few sentences in and delete the post. things are going well here. i just tried to take a few pictures of our house and christmas decor. my camera died. i need to charge the battery. after getting quite a few things done before family came, house feels even more like home. i've said it before but with each new thing we complete, we feel better and better. now, it looks like somebody at least lives in the house that our two upstairs guest bedrooms are located in. three weeks ago, those rooms just housed beds. now they actually have curtains and a few things hanging on the walls. when my battery charges, i promise, i'll post some pics. after having a fabulous thanksgiving week full of family, food, games and fun, i went back to work stinkin' tired. it was probably the longest week of the year so far. it's really hard to stay motivated between thanksgiving and christmas breaks. however, only two more weeks of work before two weeks of another much needed break.